Because of the content involved, please allow this author to present the conclusions of this article before any in-depth analysis begins. So doing is to show where this author is heading to. A reader’s independent view is always fully respected by this author. This page is tailored for web publication; therefore, mathematical equations are skipped as much as possible. For detailed support with calculations, please visit the PDF copy. (1) Hubble’s phenomenon has been affirmed by observations of nearly one century. It reveals to us that most celestial objects are receding from us with speed seemingly linearly increasing in proportion to its distance from us. (2) Hubble constant can also be qualitatively affirmed with mathematics: The receding speed of the celestial objects does have a linear relationship with their distance from us―the speed is doubled if the distance is double, speed tripled if distance tripled... 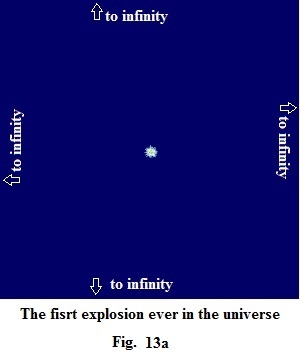 The mathematical result derived with the model of universe proposed in this article is independent of the idea of any expansion of the universe. A conclusion of an expanding universe is an illusory conjecture out of the Hubble’s phenomenon. Neither do human beings need to worry about the contraction of the universe. (a) The so called constant, expressed in speed/distance, has only instantaneous significance, but no virtual significance with respect to the distance between a celestial object and us. The speed possessed by a celestial object is always a constant speed with respect to the observer. Since an object just increases its distance at the same constant speed, the ratio of (speed/distance) must be incessantly lowered as time progresses. (b) Hubble’s phenomenon is resulted by the mechanical momentum that each of the celestial object has accumulated in the history of this object’s formation. Different object has different history. To explore how this accumulation of momentum has started and been processing is the main focus in the discussion of this article. Generally speaking, history has made those farther ones from us accumulate more of such momentum and thus resulted in their more vigorous moving away from us, but the farther ones also begin their accumulation at some later time. (4) The same mechanism causing the redshift movement of the utmost population of celestial objects has also caused the blue-shift movement of a few heavenly bodies here and there. While the proportion between the redshift and blue-shift is very contrasting, the blue-shift movement is inevitable if the red-shift movement must come to exist. The ratio between objects of blue-shift movement and objects of redshift movement must further and further reduced in the future. (5) The cosmic background noise of the universe is also an inevitable by-product out of the same mechanism that results in the Hubble phenomenon. This noise has to gradually fade as time progresses, but the fading is bound by a lower limit. (6) The existence of Hubble’s phenomenon is a manifestation of the infinitely large universe that it has been consisting of two parts, one visible part, and one invisible part. It is the visible part that has been endlessly invading, or eroding, the invisible but infinitely large part. However, no matter how aggressively the visible part invades, it is permanently “wrapped” within by the invisible part. The invasion to the invisible part is propagating with ever escalating pace and in a manner of spherically radiating outward in relation to some point inside the visible part. This “sphere” has no solid but only extremely fuzzy “edge”. This is because the entire sphere is not a solid ball but a loose gathering of numerous luminous bodies, which could be remotely distanced from each other. While some individual body of them nowadays may be traveling at extraordinary speed in pioneering the invasion, the one immediately trailing behind it may be still several, thousands, or even millions of light-years away in following. To have a feeling about this sphere, one must get to the invisible part and locate himself at tremendously large distance, many times larger than the diameter of the visible part―No human being can ever have such opportunity, of course. (7) The invisible part is no way a space of absolute emptiness. Instead, in its infinitely extensive space, patches of patches of highly explosive substance homogeneously spread all over but yet in extremely tranquil state. The homogeneous spreading is also interweaving with unpredictable local irregularity everywhere. Whatever the state the invisible part is today, it is how the visible part was in the past. In other words, any portion of the visible part was originally a portion of the invisible part. Any portion of such invisible part stays tranquil until a virgin patch in it is hit by some invading luminous body coming from the visible part. 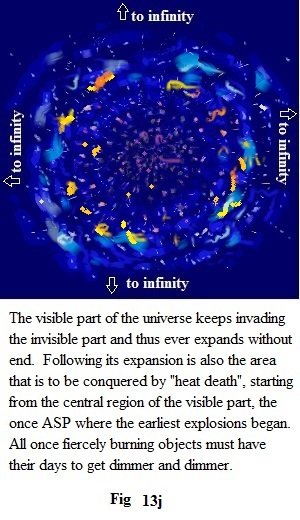 Then, an intense explosion is triggered out of the patch―one more chaotic material conversion and new movement of matter now join the already magnificent parade in the heavens and further increases the volume of the visible part. (8) Retrospective derivation of such invasions must lead us to a picture that the visible sphere in the older time should have occupied a smaller overall volume in space; the more ancient the time, the smaller the volume. Then, eventually, we must lead ourselves to seek the answer how the very initial point of the future visible part had been given birth. Again, this is the answer this article tries to explore and present. (9) No luminous chunk can last its burning forever without foreign fuel to be added. The earlier a chunk start burning, the earlier it will exhaust its burning and meet its inevitable fate―becoming a cool object. So, following the foot step of the energetic invasion made by some young burning chunks is the gradual spread of heat death destined with the older chunks, although at much later time and in scale of billions of years. It should be reasonable to conjecture that heat death started at where the visible part was first given birth then spherically spread out in space. 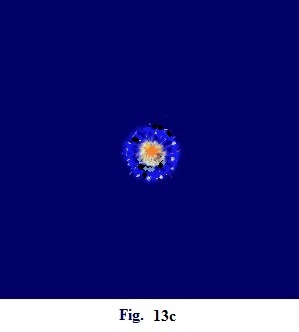 The following pictures would help to present some idea how the visible part of the universe has begun and been processing, although they are meant to be more properly presented at the end of the article. Is the universe limited or unlimited in space? Isaac Newton supported the idea of unlimited space for the universe. So far, no one seems having been able to present material evidence to reject this idea except to present some hypothetic arguments based on logic. But how sound are these logics? (A) The age of the universe appears to be younger than some objects at locations closer to us, such as some of the stars in the Milky Way. (B) A vast collection of materials looks like moving in a certain direction with an extraordinary speed. This collection spans at least one billion light-years across in space. 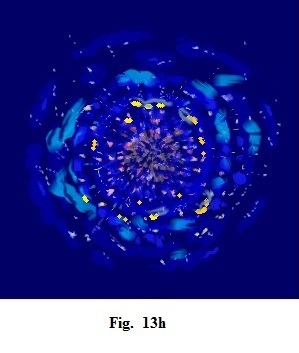 However, no one can possibly assume a “great attractor” as the gravitational power source in moving these materials. 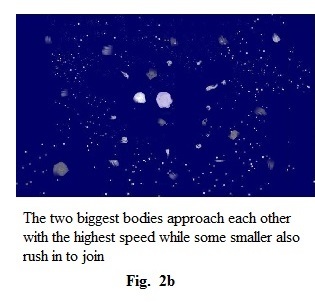 (1) The majority of heavenly objects, moving in groups, are separating from each other. (2) Heavenly objects are receding from us. The farther away they are from us, the faster they recede. (3) Objects with red shift coexist with objects with blue-shift, although the number between them is of no comparison. In other words, we do find some heavenly material collections moving toward us, although sparingly. (4) A large quantity of heavenly objects, such as planets, stars, multiple star systems, galaxies are spinning while also making translational movements. With respect to any appointed direction in the universe, the orientation of the axes of their spinning can be as random as one can imagine. (5) The distribution of materials in space is roughly homogeneous and isotropic. However, the homogeneous distribution also repeats itself with interruption of layers. (6) There exists an isotropic background noise, which is of electromagnetic nature. In history, many people held the view that the stars spread in the heavens roughly the same to infinity all over in every direction in the universe. Sir Isaac Newton sternly defended this idea. He argued that the universe was infinite; therefore any heavenly object must receive equal gravitational force exerted on it by the celestial bodies on both opposite sides of the universe. This net zero gravitational force thus shackles the heavenly body at certain location. The unlimited number of these stars hanging in the sky then just suggest to us that the overall gravitational equilibrium between them in turn enables them to hold each other at where they are. Not all people agree with Newton. Those disagreeing insisted that Newton’s idea allowed no heavenly object ever to deviate from its equilibrium position. In their view, any minor disturbance would sooner or later destroy the gravitational equilibrium between the celestial objects and would cause them all to fall towards a single point. Besides arguments based on gravity reasoning, some people also propose arguments against Newton based on other reasons, such as luminosity. 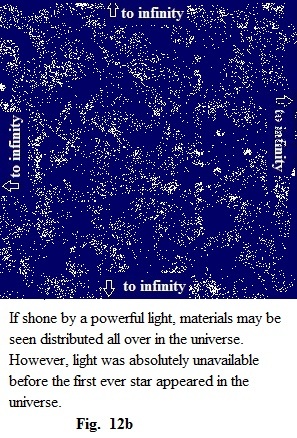 For example, H. Olbers, with his Olbers’ paradox, suggested that an infinite number of glowing objects (stars) in a limitless universe would result in infinite brightness in the sky. Since no infinite brightness in the sky is seen, a limitless universe is hard to be accepted. The Olbers’ paradox has one problem. 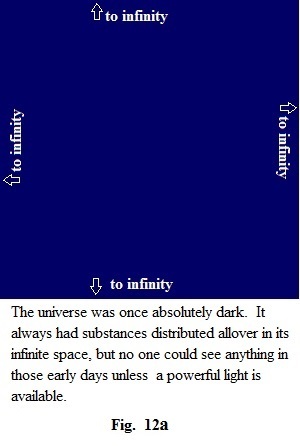 For Olbers’ paradox to hold, one must assume stars’ luminosity is perpetual, with neither beginning nor ending. However, this is not what we know about stars. The life of every star has a limited span, and so is its luminosity. 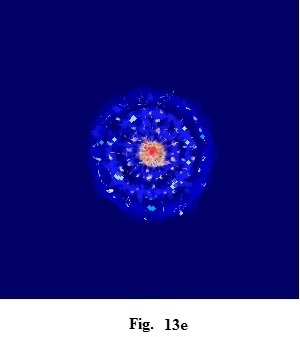 When some stars are radiating with light in the sky, some may already die, or some others are even not yet born. The limited life span of stars could only have part of the universe be shone at any given time. So, if the universe is indeed limitless in space, the part containing luminous object must be limited in comparison. Indeed the fact of dark sky that we see does conversely give us a hint that Newton’s idea of infinite space has stronger argument than Olbers’ paradox in tackling the infinity of the universe―Olbers cannot get stars that can forever shine. Sir Isaac Newton lived in a time that the nature of the stars was hardly known. To people of his time, the extraordinary amount of energy that can result from nuclear reaction was unimaginable. Otherwise, those supporting Newton’s view may extend Newton’s arguments with more reasons, while allowing certain local gravitational equilibrium in Newton’s gravitational landscape to be destroyed due to the occurrence of some minor disturbance. (1) Indeed, what if the defect did happen and some celestial objects did once fall to a single point? Gravitational disturbance seems so irresistibly omnipresent. (2) What if, when the falling happened, all those falling materials happened to be of something containing high internal energy, such as the nuclear fuel that we know of today in the stars? Since all stars have limited life span, retrospection in comparing the life between them must lead us to believe that there had to be a first ever nuclear reaction to have brought in the very first star in the universe. Before this star showed up, once upon a time, the entire universe could only be dominated by absolute darkness. Neither was there apparent movement of anything. Lifeless as it could be, however, the universe was not devoid of substance, because the first ever star must require fuel to have been stocked beforehand for its birth. Since no part of the universe can be preferred for any reason, probability must allow some fuel gathering like what was required for the first star to have been stocked anywhere and subsequently everywhere in the universe; only randomness could have governed such stocking. However, in so speculating, we must also abide to the observational fact that the mass density per unit volume for the universe was low, lower than any vacuum that human could achieve on earth today. With the low density, material gatherings during those early days could only be quietly distancing themselves from each other because of the gravitational equilibrium between them, as insisted by Newton. 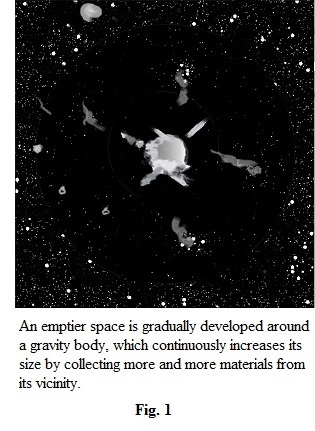 In an unlimited space, absolute homogeneity of material distribution is impossible. Therefore, local defect on the overall gravitational balance between materials must present here and there. At where defect appeared, material particle could not help to pull each other closer and closer. As they came closer, they further enhanced the local defect and further skewed the local gravitational equilibrium; material collecting each other is a normal consequence of such skewed equilibrium. As the defect happened everywhere, the local gradual accumulation of materials also occurred everywhere in the universe. This grouping of materials was time-consuming. It is especially so if the mass grouping started from particles as tiny as single atoms that consist of single nucleon. Being eternal, the universe has no “initial” state. Anyone pursuing the primitive state of the universe can only start at some point where catastrophic abruption introduced itself. Evidence about the more primitive state before certain abrupt occurrence of the universe must have long lost, especially after the appearance of the first star. Accompanying with the appearance of each star is a serious of irreversible but violent reactions, both chemically and physically. Given that the universe has had a history of billions of years of star showing, no one could reasonably expect to be able to get access to the evidence so forcefully destroyed by the star formation of a history so long ago. It is possible that the universe just kept the same primitive state for an infinitely long time prior to the appearance of the first star. But the pursuit of such state is definitely beyond the scope of this article and beyond the capability of this author. 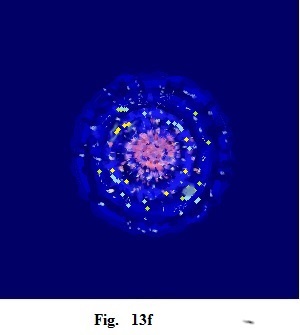 So, let’s just start with an assumed state for the universe: lying quietly all the time with all the simplest single atoms (but not yet molecules at all) “floating” in it, the universe just idly “waited” there forever for some accident to happen within it. It is only reasonable to expect that the state filled with only single atoms for the universe is more primitive than a state in which some more complicated molecules have appeared. That said, neither can anyone decline the existence of an even more primitive state for the universe before the state of single atoms appeared. But, again, we are only interested in the universe of the time around the formation of the first star. If gravitational gathering, or accretion, of mass initiated by local gravitational defect had started from a state of atoms, calculation would show that the universe had at least 10 billion years for such accretion to progress before the debut of the first ever star. Countless local defects showed up at countless locations, with some being more prominent than the other. A material group that has collected more materials must further increase its potential to collect even more materials from its vicinity. There is no local defect that would limit its gravitational influence to only its local. Any of them must extend its influence to infinity although each of them had a different potential in exerting its influence to the others. The one with a stronger potential in a bigger territory would play the role of a predator in a larger space, attracting the materials from a bigger distance. Some single point of gravitational attraction may not have to have materials sitting in it. For example, to an equilateral triangle with equal masses at all its apexes, the single point of gravitational attraction is at the triangle’s geometric center, where no mass is found. Of course, this point’s emptiness can only last for some time. If no other material chunk in the neighborhood can pull these three equal masses away from each other, they would all eventually fall into the center of the triangle. (1) As a material body grows due to more materials having fallen on it, a comparatively emptier space around it gradually appeared. (Fig. 1) With the progress of time, this emptier space expands. (2) Imagine we ever stood on this growing body with a powerful spot light. At any direction we look with the spot light, we would see a dome enveloping us with a very fuzzy and puffy spherical “surface”, or “wall”, consisted of patches of patches of clouds of those highly explosive materials. The distance from us to the dome’s surface is huge. If we can slide out a complete thin layer of certain thickness from the spherical wall, the material quantity of the entire layer would be proportional to 4πR2, where R is the distance between us and the wall of the dome. Each time after the materials of a thin layer completed its falling onto where we stood, we would see a newer dome of bigger radius show up at where looked before. We could reasonably expect to receive a bigger quantity of materials whenever a new doom wall of the same thickness felt as the previous one did. (3) The more materials from a bigger distance (the ever increasing radius of the dome) and the ever increasing size of the body on which we stood can only mean that the magnitude of each collision gets stronger and stronger as time progresses. As long as the universe is infinite, the supply of celestial materials that could fall and collide at a single location would never be exhausted. Such single locations are as many as the locations where gravitational defect can be found in the universe. Each of the growing body of gravity never stops summoning the neighboring one, although the size of each of them is different and so is the gravitational influence from each of them. Gravitation is a ceaseless laborer in nature. Material collisions yield heat. The ever increasing magnitude of collisions, both in material quantity and mechanical power, can only introduce chance for the temperature of the aggregated materials to increase without bound if the heat cannot find a timely escape. If the materials joining the collision were carriers of powerful internal energy, the ever increasing temperature may sooner or later go over a threshold and ignite the internal energy for a sudden release. Sudden release of energy could only mean an explosion! A fluid body getting to unusually large volume can have the explosion triggered in two ways. Way one: Its unusually large size, larger than all the others, caused an abrupt disturbance on the gravitational equilibrium in its neighborhood. Materials in the adjacent space were pulled so rapidly together that the heat so accumulated could not have enough time to escape. The temperature being so endlessly forced to rise subsequently triggers the explosion when it reaches some critical value. 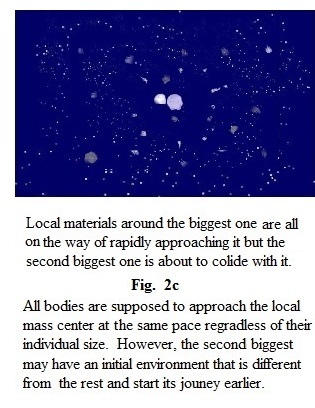 Way two: Once the mass quantity of the accumulated body reaches a certain but unusually big size, it suddenly implodes because it could no longer withstand its own gravitational pressure. The immense heat so produced could also have ignited an explosion. We could not say with certainty which way had actually made the first star debut. With an assumed primitive state of single atoms of the simplest nucleus for the universe, the above explosion could only be a nuclear fusion reaction. An atom with the simplest nucleus is just a hydrogen atom, although at the time and at the location where the first explosion occurred, those atoms would have long united as molecules. While this article is unable to retrospect where the single atoms had come from, it is a fact that a great abundance of hydrogen is found throughout the universe of today, and the abundance is even left behind after so many celestial infernos have been burning in the sky for so many billion years. After the explosion, chunks of furiously hot materials were ejected from this single point hosting the unusually large body, and they flew in all directions. Naturally, each of these flying chunks was a burning torch sustained by fusion reaction. If any of them happened to land on another celestial object of sufficient size and of the same fuel, it would just ignite a new explosion out of the object. As previously mentioned, celestial objects were expected to continue to amass at the single point of the first explosion, because this location had once hosted the most unusually large material body. The happening of the explosion would not instantly prevent them from continuing their gravitational journey. Now, let us call this single point the Assumed Single Point (ASP) in our model of illustration. As the newly born flying torches sped away from the ASP, they may potentially collide with the objects that were already on their way towards the ASP (Fig. 2a, b, c, d, e). When they met, a second wave of explosions was ignited but at locations away from the ASP. Accompanied with the second wave of explosions, a second generation of flying torches was also born. In this processing, we need to keep this in mind: Statistically, all the geometrical points hosting the second wave of explosions would encompass the ASP in a roughly spherical manner. There were two reasons for such an isotropic happening. Reason one: more objects were still falling to the ASP under gravitational influence, which is always isotropic. Reason two: the ejection manner of the torches from the ASP was also isotropic. However, we could not expect that each of the explosions of the second wave must happen precisely at the same time, or that each of them must happen with the same magnitude. 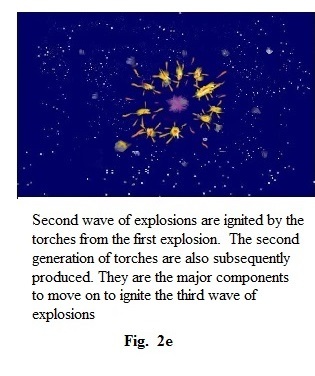 With respect to any point where each of the second wave explosions happened, the torches of the second generation from each explosion also flew in all directions as if wrapping their birth place with a fuzzy sphere―therefore many spheres altogether. Now, let’s define a set of terms that will be used throughout the rest of the article before we move on. Radial line: any straight line, or ray, that starts from the ASP but points in any direction. Tangential direction: Any direction that is perpendicular to a radial direction. Virginal materials: The materials that have never been converted by explosion. Virginal object: A celestial object that contains virginal materials. Further, a velocity towards the ASP will be designated with a negative value; otherwise, the velocity will have a positive value. (1) Their population is bigger. This is only natural. (2) They were younger, of course. (3) A major population of them would more or less show tangential movement in relation to the location of the ASP. 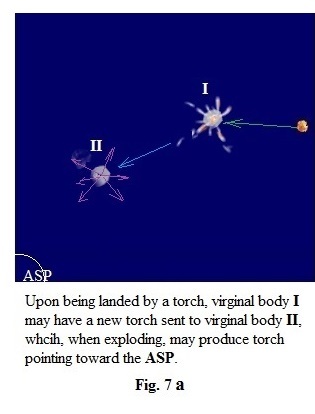 When a first generation torch hit a virginal object that was oncoming toward the ASP, its outgoing momentum must reduce the movement of this oncoming virginal object. 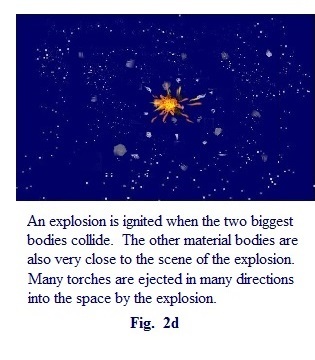 As such, two newly born torches out of each of the second explosions would consequently move with speed contrastingly different from each other if they happened to move along the same radial line. The one moving away from the ASP had far higher speed than the one moving toward the ASP. The higher speed value for the moving away one was resulted by the accumulation of two momenta: the one that is naturally bestowed by a nuclear explosion of the virginal body, and the one added through mechanical transferring by the landing of a torch of the first generation. (Fig. 3) However, the speed for the one moving toward the ASP was the result of the subtraction by the same momenta. There are many more torches out of the second explosion than the two just mentioned. In relation to the ASP, the flying torches of the second generation had a great variety of directions to fly along. These directions could have been directly away or directly towards the ASP, they could also have been tangential or anything between the tangential movement and redial line movement. 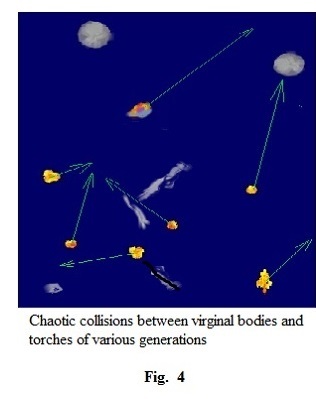 For those torches whose final combined velocity happened to be away from the ASP, they had a chance to induce a similar explosion from those virginal objects which were rushing toward the ASP at even later time. A third generation of torches was thus born, but at locations even farther away from the ASP than the birth place of the second generation. Statistically speaking, the locations where the explosions of the third generation occurred also enveloped the ASP in a spherical manner like the second generation but the newer sphere had a larger radius. Since the flying torches of the third generation were born later, they should generally have a younger looking than the torches of the previous two generations. For those third generation torches moving away from the ASP, their speed would be higher than that of the first generation and the second generation. The reason is simple. When they were born, besides the momentum naturally bestowed by the nuclear reaction out of the virginal materials, they also received a mechanical momentum transferred on them from the torches of the previous generations. 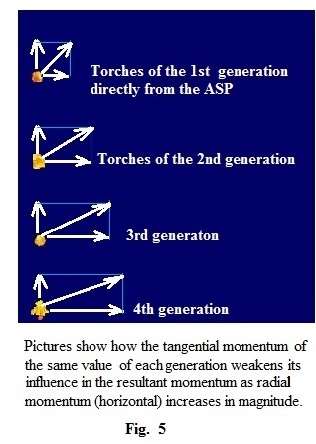 If the torch transferring momentum is of the second generation, the momentum is even an accumulation of the outgoing momentum from two generations. Besides, virginal bodies coming toward the ASP as the candidate contributing the explosions of the third generation were generally slower than those candidates of previous generations. 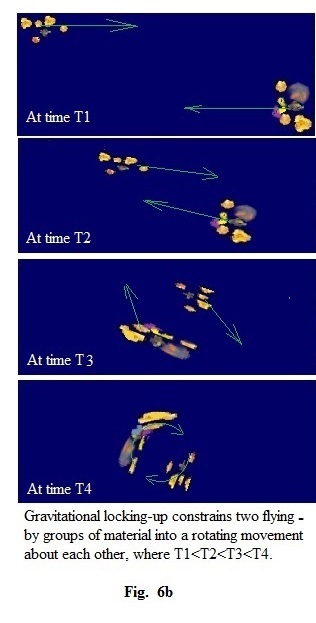 This further allowed the momentum coming from the ASP direction to have a stronger influence on the resultant movement of the third generation torches: speed leaving the ASP is further escalated; speed approaching the ASP is further subdued. If this reaction of momentum transferring continues generation after generations, it is easy for us to imagine that torches of newer and newer generation would carry higher and higher speed leaving the ASP. 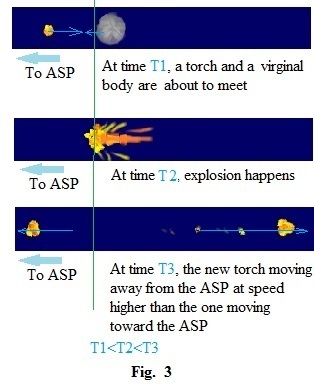 The picture presented in Fig 3 can happen to any generation of explosion, except that the speed value for those moving toward the right, or away from the ASP, is ever increasing. One interesting point of movement in Fig. 3 needs our attention. The green line in the pictures is drawn through the mass center of the union of the torch and the virginal body together. This green line may actually be moving at certain speed, “+” or “-“, with respect to the ASP. 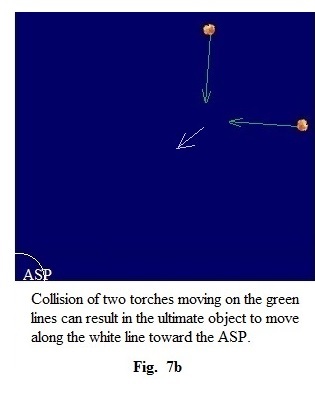 While the torch moving to the left after the explosion is away from the green line and seemingly appears to have been moving toward the ASP, it may actually be on a movement increasing its distance from the ASP if it is produced by explosions later than certain generation number. (1) It landed on a virginal body, causing the birth of the fourth generation of burning torches. (2) It collided with one or more of other torches. (3) It never collided with anything but stayed as a free wanderer in space. During its free movement, the nuclear reaction it carried with also gradually extinguished. Usually a smaller one would extinguish earlier. (Fig. 4) For those that are exceedingly small but naturally of large population, they would quickly become millions of asteroid-like objects aimlessly cruising in space forever. Indeed, these same chances are true to the torches of any generation. The birth place of each generation of the torches gradually appeared farther and farther away from the ASP. Soon (in the astronomical scale) after the first explosion, there finally came a time that positive velocities for the torches overwhelmingly prevailed in space. Fire and explosions just spread as far as the flying torches could race forward, all seemingly stemming from the ASP in a big picture that includes all of them. 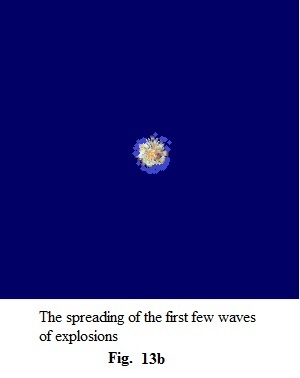 For the first few waves, the propagation of explosions should have occurred rather quickly one after another, because the virginal objects had moved relatively close to each other. But, virginal objects were originally far apart from each other before they were gravitationally summoned towards the ASP. After certain waves, the flying torches had to dash across larger and larger distances to hit virginal objects. Eventually, the distance through which they would hit a virginal object would be more normally matching the statistic value that was determined by the universe’s natural mass density. Depending on the size of each torch, and thus the quantity of nuclear materials that it had carried, and depending on the actual distance each had to dash across, the fusion reaction with it may or may not enable the torch to outlast the journey of finding new virginal body to land on. Because of the manner how the torches are produced, there are always far more torches on the tangential movement in space. However, while the absolute value of the speed of the tangential movement generated by explosion remains the same generation after generation, its relative strength compared to the radial movement is diminishing in the resultant speed for each newer generation of torches. (Fig. 5) This is because the radial momentum of every generation is incessantly accumulated. 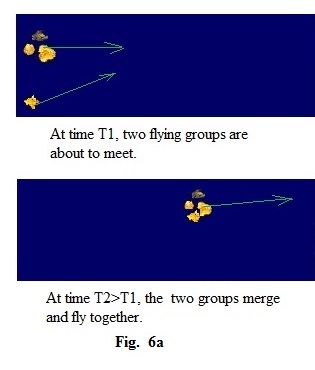 Besides direct collisions, flying bodies could also gradually merge if their flying directions are about the same and they are moving close enough. They could also lock each other up through gravitational influence without ever physically contacting each other. Of course, rotation was inevitable if the gravitational locking-up was going to be stable. The rotation will be resulted if two flying bodies meet on opposite movement but with their mass centers missing each other, while the gravitational force between them is strong enough to hold them together. (Fig. 6a, b) Either through collisions, merging, or gravitational locking-up, the new combination of materials continues its journey that is determined by its ultimate residual translational momentum with respect to the ASP. To the absolute major population of them, moving away from the ASP is destined while an extremely few of them may appear approaching the ASP. The way how the touches have been multiplied gradually forces more and more crowding during their meetings that happen at later time. This gives us a hint why material gatherings in the heavens with more mass are usually found farther away from us in our observation. The later some torches are produced, the stronger the moving momentum they would carry because the momentum forcing on their birth had been more forcefully accumulated. If these torches happen to come to establish a rotating system, the system would also store more angular momentum because of the increase in both mass quantity and angular velocity. The overall magnitude of the angular momentum for all these systems thus also follows this pattern: when they are farther from us, they have higher chance to be found with higher angular momentum. Of course, the chaotic moving state of all these materials before they came together must result in the rotating axes orientated as random as one can find. Statistically, not only those more remote gatherings of celestial materials are more massive and possess more mechanical energy with respect to the ASP, but they are also more powerful in radiating electromagnetic energy. This is easy to understand because of three reasons. Reason one is that they are younger than the average objects appearing in our vicinity, so much more energy yet untapped before they join together. Reason two is that the further they are from us, the stronger mechanical energy they would have when striking at others, which have also been conditioned with so much violent energy accumulated through so many generations. Reason three is that the impacts of high quantity materials of many generations have outrageously escalated their mass density. The energy released from these highly dense materials per unit space can also be outrageously concentrated. All three reasons come together could have made a particle accelerator we build on earth out of every inch of them during their substance smashing. This is why objects like quasars do not appear in our vicinity but near the “edge of the universe” (Edge of the universe is a term coined by Big Bang theory supporters. The universe has no edge. Any “edge” human would see can only be the most front line of the visible part of the universe). The manner how torches are produced in older space has never been powerful enough to give chance for powerful object like quasars ever to appear. Data show that, for example, if Quasar 3C 273 is in a distance of 33 light-years from us, we would see it as bright as our sun. This quasar’s luminosity is about 4 trillion times that of the sun, but is also actually in a distance of billions of light-years from us. After a long life of burning, all burning bodies must come to a time to have their fuel exhausted and their thermal powered lowered or even terminated, but they continue to drift in space indefinitely. When random chance happens to have them shuffled into some huge material conglomeration, they may have located themselves not too far away (in astronomical scale) from some virginal objects. These virginal objects have also been just hurled into the conglomeration because of some previous material gathering in some other locations. In other words, each of such large conglomerations of heavenly wanderers is actually a salad bowl of members of various ages and various natural properties from various “hometown”. The ultimate combination of momentum contributed by all these members determines how the salad bowl would move in the sky, i.e., how fast it moves and toward which direction as well as how rapidly it spins and how the spin axis orients. Such a salad bowl picture should now help us to reduce the surprise concerning the crises mentioned in Flamsteed’s article: (1) the exceedingly old age for some members in the Milky Way compared to the “age” of the universe, and (2) the inexplicable speed of some big collections of heavenly materials but at the absence of any “great attractor”. 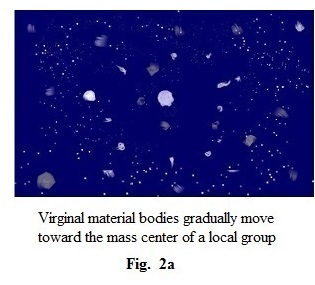 The salad bowl picture also strongly suggests to us that a majority of the material organizations, such as galaxies, in the universe could not have been born and evolved locally. This would further lead us to believe that our Milky Way could not have evolved locally and thus inherently come down from one unique cloud disk. Instead, it is a material collection of matters joining together from contrastingly different backgrounds, such as ages and birth places. However, so much of this background information could have only been lost in record. (1) He is leaving the ASP (which can never be in his vision but in history) with a constant speed. All objects with the same distance from the ASP like the one his riding on would have the same speed leaving the ASP. A hypothetical sphere enveloped by all these objects seems expanding with respect to the ASP. 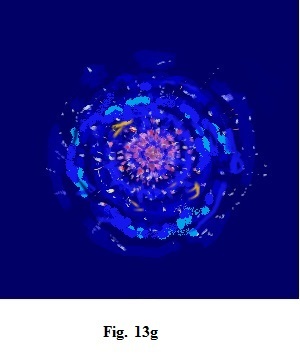 A sphere hypothetically formed in the same manner but with a bigger radius would expand more rapidly. (2) Objects on the same but expanding sphere generally appear to him as if they are separating from him, as well as from each other. However, he may still find that a few of them on the same sphere slowly moving toward each other. This is so resulted because only randomness has governed the orientation of residual tangential movement of all objects. If a glowing object happens to appear approaching this observer, he would see blue-shift movement from this glowing object. (3) A heavenly object that is closer to the ASP possesses lower speed leaving the ASP. Let’s call it object A. Another object but is farther away from the ASP possesses higher speed leaving the ASP. Let’s call it object B. An observer between A and B would easily conclude that both objects are leaving him, because, without his awareness, he is riding on an object that possesses a speed higher than A’s but lower than B’s. If by some random chance A’s speed happens to be higher than normal, or B’s speed lower than normal, or even the speed of the observer’s vessel happens to be unusual, the observer may possibly have chance to detect blue-shift movement from either A or B. Because of all these movements, the major material flows in the heavens just present to us what is described as Hubble’s phenomenon. (1) Many waves of the explosions after the initial one could still powerfully eject their newly born torches along the radial line toward the ASP. Probability must allow chance for a big quantity of the newly born torches pointing toward the ASP to have escaped the capturing of those outgoing torches. So far we have only mentioned the mechanical effect exerted on the material flows of heavenly bodies by the nuclear reactions. As we all know, nuclear reaction must also release huge amounts of radiating energy, which includes all forms of luminosity, optically visible or invisible, and the so-called background noise as well. Now, let’s shift our interest to this subject: the background noise. However, before that, we need to set up a mathematical model that must also corroborate all the mechanical phenomena mentioned in all previous arguments.